Methane emissions from natural gas production — including hydraulic fracturing, or “fracking” — are lower than previously thought, according to a major new study from researchers at the University of Texas. The research was done in close coordination with the Environmental Defense Fund (EDF), a major U.S. environmental organization. 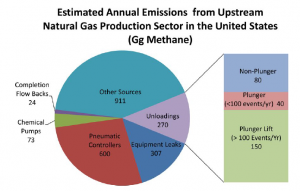 The study, published today in two parts in the journal Environmental Science & Technology, finds that methane emissions from the upstream portion of the supply chain are only 0.38 percent of production. That’s about 10 percent lower than what the same research team found in a study released in September 2013. The researchers also noted that a small number of sites accounted for the majority of emissions, suggesting that technologies already in use across the industry are effectively managing methane leakage. The emissions rate in the study released today also corresponds with the U.S. EPA’s estimates for methane emissions, which are far lower than what anti-fracking groups frequently claim are “leaking” as a result of fracking. Earlier this year, EPA observed that methane emissions from fracking have fallen by 73 percent since just 2011. Since 1990, methane emissions from U.S. natural gas systems have declined by nearly 17 percent. 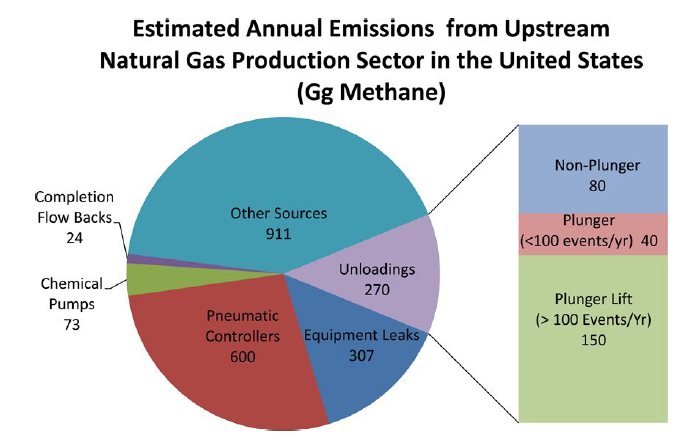 A chart accompanying the research shows total methane emissions of 2,185 gigagrams (Gg), or approximately 0.38 percent of total natural gas withdrawals and production in 2012, according to data from the U.S. Energy Information Administration. The findings from the UT/EDF study cast more doubt upon the claims of groups that oppose fracking, who have made “methane leaks” a key component of their advocacy against U.S. oil and natural gas development. Last year, Gasland filmmaker Josh Fox wrote that President Obama “does not have the right information on fracked gas,” alleging that “methane is leaking like crazy” from oil and natural gas production activities. Food & Water Watch, one of the most aggressive anti-fracking groups in the country, claimed last month that natural gas is “proving to be more of a ‘gangplank’ to climate chaos,” based upon claims of high methane leakage rates. The group linked to a 2013 op-ed by Cornell University activist Tony Ingraffea, whose claims were refuted by climate scientists just days after his column was published. Al Gore has also criticized fracking, based upon assumptions of high methane emissions. Most scientists, however, have found that natural gas will retain its environmental and climate advantages if methane emissions are kept under two to three percent of total production. The U.S. EPA’s data, which are largely corroborated by today’s UT/EDF study, suggest a leakage rate of only about 1.5 percent. Although the research does show methane emissions on the right trajectory, the study also finds that a “small subset of natural gas wells are responsible for the majority of methane emissions,” according to the press release associated with the report. That means most wells and their associated equipment have been effectively designed to mitigate or even eliminate emissions. “…the measurements reported in this work had large numbers of devices for which no emissions were detected during the sampling period” (p. 14; emphasis added). The finding that a “small subset” of sites is responsible for most emissions meshes with what EDF President Fred Krupp said earlier this year, when he noted that “we have the technology” to reduce methane emissions. “This is essentially a data acquisition and management problem — the kind that we know we can solve,” Krupp wrote in an op-ed for the New York Times, co-authored by Michael Bloomberg. The UT study was funded in part by EDF and several energy companies who agreed to participate in the research, and who provided access to the well sites for direct measurements. According to the study, the sites where measurements occurred were not selected by the companies, but rather chosen at random by the researchers themselves.